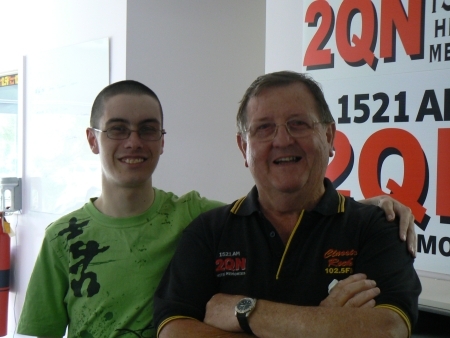 It is with much regret and sadness that I have to pass on the news that the voice of Deniliquin, Paul Dix, passed away this morning after a short illness. He was aged 80. Paul had been the breakfast host at 2QN Deniliquin for about 51-and-a-half years, and had worked for 3MA in Mildura before this. In recent years Paul had also pre-recorded an afternoon program for 3NE in Wangaratta after finishing his 2QN show. To say Dixy will be missed is an understatement as he was and always will be an integral part of our team. Paul’s many friends and listeners in our coverage area will miss waking up with Dixy each morning and at this sad time our thoughts and condolences are with his wife Margaret and the family. Further details as they come to hand will be advised and once again our thoughts at this sad time are with the Dix family. Paul will be very sorely missed in Deni and beyond. He was a very kind man who always had time for a chat and had a great sense of humour which made most things seem better. I will always fondly cherish the brief time I spent working with Paul, and will cherish his ongoing friendship even more. The memory of him appearing at the radio station’s back door in his tiny little car, as happy as could be, just before 5am each day, is an image which will stay with me forever. Paul is a true gem of Australian history. It is a real shame that, due to the fact that he spent so long in a regional town, that he doesn’t have anywhere near as much name recognition in the wider community as people who have spent similar amounts of time in Sydney radio. To an extent though, I think Paul would have been happy about that…he was known and loved by a specific community, and he cared about that community. My sincere condolences to Paul’s wife Margaret and family, to all of the staff at 2QN and 3NE, Paul’s friends, and the broader community of Deniliquin. I would wish Paul and peaceful rest, but somehow I think he’ll be up at 3:30am every day to do the breakfast show on the great radio station in the sky, and heaven will be a much more interesting place because of it. Yes it is a sad day; with the passing of such a gentle man as Paul Dix. Although myself being away from Deni for several decades (departed back to Sydney from there Dec 1967), Deni has never left me. And I know I am not alone in stating this. I think you’re right that Dixie is a symbol of the resilience and spirit which has kept Deni going through many tough times. His memory will linger for a long time to come, and I hope that his memory helps to provide Deni with the strength of conviction to keep going and stay the course through the next drought or other tough time. Thanks again for your thoughts Noel.